The iMSA is ranked in the top three accounting programs in the US and is taught by some of the best faculty in the world. Through the iMSA, you’ll get hands-on practical experience and learn cutting-edge analytics that will help you become a standout candidate to potential employers. Companies want access to data because data-driven companies make better decisions. Highly data-driven decisions-makers can look back when needed and use predictive and prescriptive analysis to model the future. 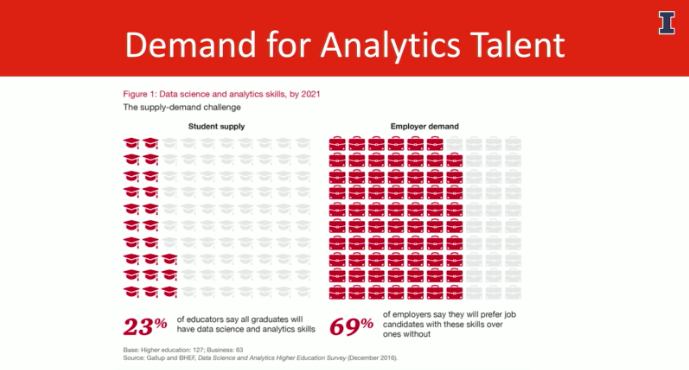 And demand for analytics talent is growing. Accountants of the future are expected to have data science and analytical skills, and the iMSA ensures that students are well prepared. From Ernst and Young’s April 2018 announcement about blockchain audit technology to leaders from Deloitte and Capital One who visited Illinois as part of the Lyceum series– all of the major accounting and audit firms are responding to rapid changes impacting the accounting industry as a result of technology. You’ll learn to ask the right questions, extract, transform, and load relevant data. You’ll apply appropriate data analytics and interpret and share results in a digestible way. Unlike other programs, analytics are a main focus in the iMSA and all courses help you develop your data evaluation techniques. Sign up for the Data Analytics Foundations for Accountancy I course from the iMSA and get started today. You’ll learn Python, statistical data analysis, and the basics of data visualization. And if you are accepted into the program, you’ll get credit for the course. Learn more and apply for the Master of Science in Accountancy. Explore business degrees offered on Coursera.